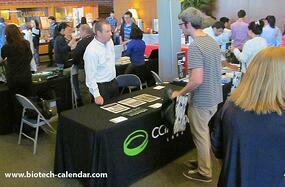 Berkeley BioResearch Product Faire™ Event has only eight spaces left. It is true: there are only eight exhibit spaces left at the Berkeley BioResearch Product Faire™ event. Our most recent Northern California events brought over four hundred researchers seeking new products, and some companies saw hundreds of thousands in potential new business by participating as exhibitors. The university has three years remaining of a $500M grant from BP Global Energy. The National Institutes of Health (NIH) awarded the university $730.7M in science research funding. The university is currently using $30M to create a 22,000 square foot new chemistry and chemical engineering facility. We’d like to invite lab product and service suppliers to join other top exhibiting companies in 2016 in networking with researchers at this popular site. Save on exhibit space now. Register by March 9, 2016 and save $250 on one of the eight exhibit spaces still available in this top-funded market. Would your company like to sell lab products to researchers at three northern California universities in one week? UC San Francisco BioReseach Product FaireTM event on 6/9/16.